Ladies, let’s admit it. Not many of us are lucky enough to be blessed with long and thick eyelashes. While some people have gorgeous eyelashes worth falling in love with, there are some (like us) whose eyelashes are well, what can we say, not up to the mark? But guess what, ladies? There’s no harm in faking it. Absolutely no harm at all. In fact, one of the secret tricks to looking majorly glam is popping on a pair of fake eyelashes. Long, luscious eyelashes make everything so much better. They make your eyes look wider, bigger, and more open, almost like Bambi! They definitely add drama to your makeup look. Now, you might think that applying false eyelashes can be a wee bit tricky. Either they don’t stick right where they are supposed to, or they simply fall off before the night even ends. Admittedly, gluing those fake little darlings can be stressful. However, it doesn’t always have to be that way, honey. We are here to the rescue! We have broken down the seemingly tedious procedure of applying false eyelashes into small and easy steps. Read on, and learn how to apply false eyelashes for beginners. Applying false eyelashes need not be intimidating for you anymore. They may be intricate to put on, but in the end, they are so worth it. They can elevate your look immediately. You cannot allow anyone to make you feel that false eyelashes aren't for you. Anyone can pull them off, as long as they follow the following simple steps and tips. Gently hold the opposite ends of your false eyelashes and curve it in a U-shape. 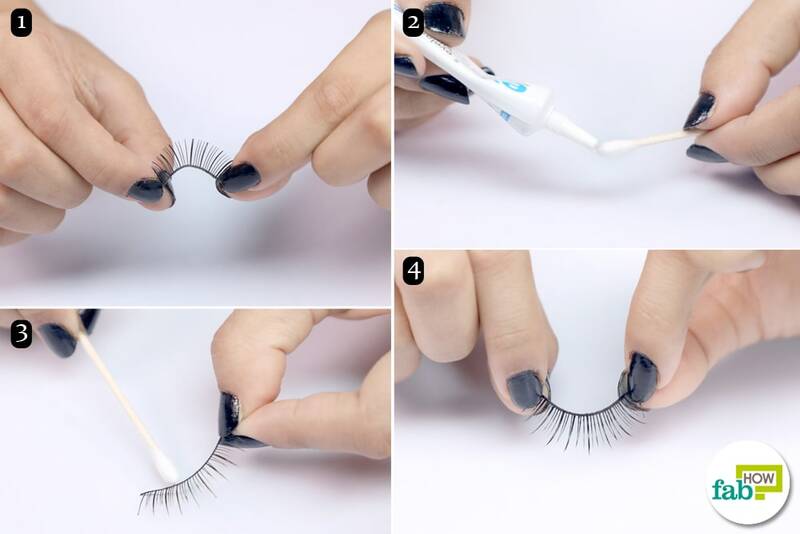 Take eyelash glue and squirt one drop of the glue on the Q-tip. Apply the glue to the band of false eyelashes all the way across. Wait for about 20 seconds for the glue to become tacky. Curving the eyelashes allows them to conform to the shape of your eyes. A curvy eyelash is easier to apply and also sticks better and longer. This way the eyelashes will also not slip around when you apply them. The eyelash glue that you use should be of very good quality. When you use an eyelash glue for the first time or a new one, it is advisable to perform a patch test to be sure that the formula is compatible with your skin and does not cause irritation. Gently lift the false eyelashes from the middle with the help of a tweezer. Stick the false eyelashes to the center of your eyelid first, then smooth in the edges. Check using a mirror to ensure that you have placed the eyelashes in the right position. Gently pinch the false eyelash between your index finger and thumb to check if it is properly attached. The false eyelashes have to be applied right on top of your eyelashes so that they blend in smoothly and look natural. Eyelashes that stick out separately obviously appear fake. 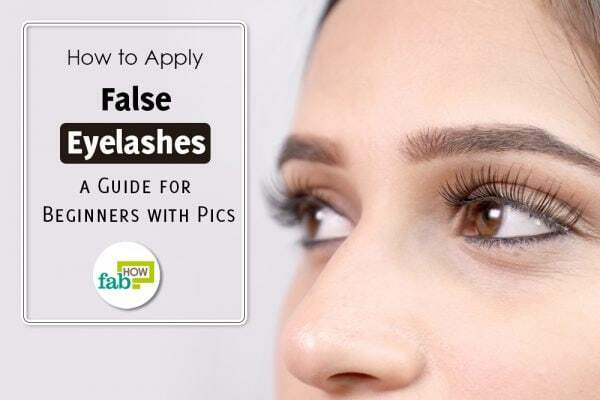 With only two easy steps, you have successfully applied false eyelashes! See how perfect it looks on you! Before you apply your false lashes, prep your real lashes as you normally would with mascara and your usual lash products. Always pick a pair of false eyelashes that is slightly longer than your real lashes and made from natural hair. Never sleep with your false lashes on. To curve the false eyelashes, you can wrap it around the handle of a makeup brush for a few minutes before applying it. Before you apply the false eyelashes, don’t forget to measure them against your eyes and trim them to fit your eye shape. Once you have applied the false eyelashes, add an extra line of eyeliner and a layer of mascara to blend in the false lashes. Avoid touching your eyelashes once you are done. The more you touch them, the more easily they might fall off. Always apply makeup before you apply false eyelashes. False eyelashes are not waterproof, so be very careful. 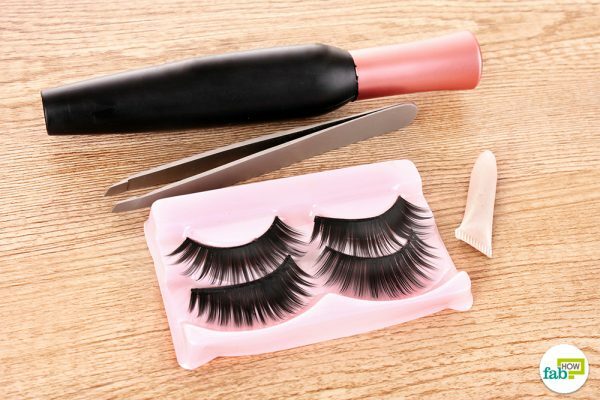 You can cut your false lashes into little pieces instead of gluing an entire strip. You could even buy false lashes that are already cut into short portions. They not only give more length and volume to your real lashes but also look quite natural. You can use mini false eyelashes on your bottom lash line to make your eyes pop even more. To properly use a mirror during eyelash application, place your mirror flat on the table and position your elbows on either side. This position will allow you to directly look down on the mirror. 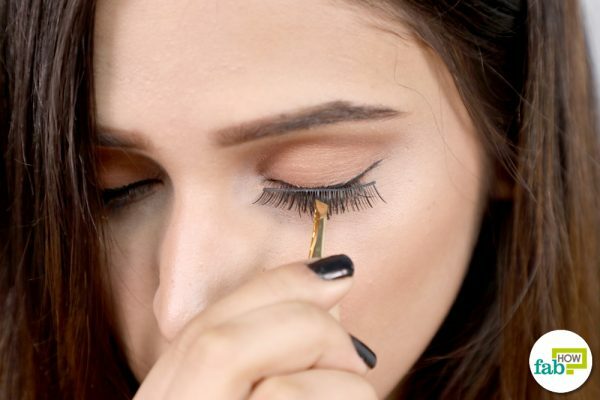 To remove the false eyelashes, use a Q-tip and oil-free makeup remover. Soak the Q-tip with the makeup remover and gently rub it on your lash line. The lashes will fall off easily. To remove residual eyelash glue from your eyelashes, apply coconut oil using a Q-tip on your lash line after removing the false eyelashes. To remove excess glue from the false lashes, use tweezers to gently pull off sections of glue left on the band of the eyelashes. To clean your false eyelashes, add a drop of liquid soap to lukewarm water and gently rub the lashes. After cleaning your false eyelashes, store them in a clean container so that they can be used again later. Always allow the glue to dry a little bit and become tacky before you stick the false lashes to your lash line. The drier the glue, the better it will stick to your lash line. If you have oily eyelashes, then blot the excess oil with a blotting paper. Oil makes it hard for the eyelash glue to bond the false lashes to your lash line. To remove the false lashes from the box, hold the packet under your nose with the lashes facing outwards. This will help you identify the right and left lashes. 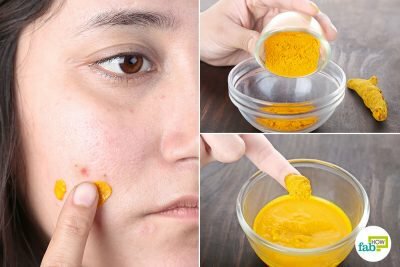 Also, while removing them, peel them off from the outer edge, never from the inner corner. If you want to measure your lashes, hold the false lashes against your lash line. You will get an idea as to how much of the false lashes need to be trimmed. Always trim your lashes from the outside edge. As far as false eyelashes are concerned, one size doesn’t fit all. To help decide which set of false eyelashes suit your eye shape better, we have here a few pointers for you. Deep-set eyes – If you have deep-set eyes, your brow bone appears prominent. Choose lashes that are longer in the center. 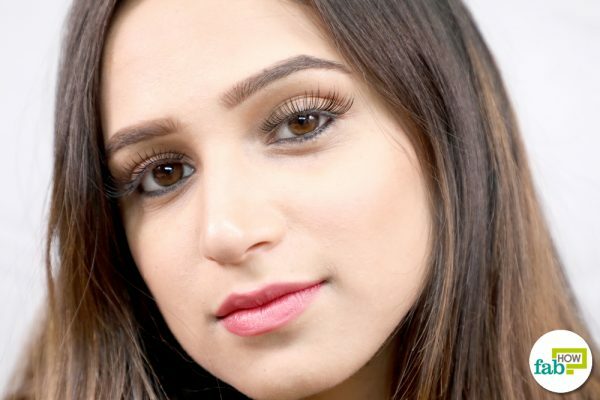 Downturned eyes – If the outer corners of your eyes are tilting downwards, then go for shorter-strip lashes that are longer in the outer corners to lift your eyes. Hooded eyes – If the crease in your eyes isn’t visible, then try a thin strip of shorter-length lashes. Prominent eyes – If your eyelids appear projected in the eye socket area, then apply strips of lashes in the bottom lashes to balance out your upper lashes. This will create an illusion of pushing back your eyes. Close-set eyes – If the distance between your eyes is smaller than the width of your eye (one eyeball), which is common in people with a slender nose, then use lashes that are longer at the outer corners. This will widen your eyes. Wide-set eyes – However, if you find that you have a wide gap between your eyes, then you need to use lashes that are longer in the center to achieve balance.